re-set an adjusted program to its default settings at any point. Do you enjoy cooking experiments? Open up the whole world of boundless possibilities with “MASTERCHIEF”! REDMOND RMC-250: SET YOUR OWN RULES! Cooking process is fully automated. The device is equipped with automatic programs that enable to cook meat, fish, poultry, seafood, porridges, soups, pasta, rice pilafs, yoghurt, fondue, and jams, deep fry foods, proof yeast dough, bake, and much more. 3D heating technology ensures even heat distribution, helping to retain mineral and vitamin content of foods. Additional features include “KEEP WARM” and “TIME DELAY” functions. The main highlight is “MASTERCHIEF” function, enabling to create, save, and recall new programs. The function is the latest technology, developed by REDMOND engineers. It enables to adjust cooking time and temperature during cooking cycle (except “YOGHURT”), to save the adjustments to the memory of the appliance, and to recall them later. 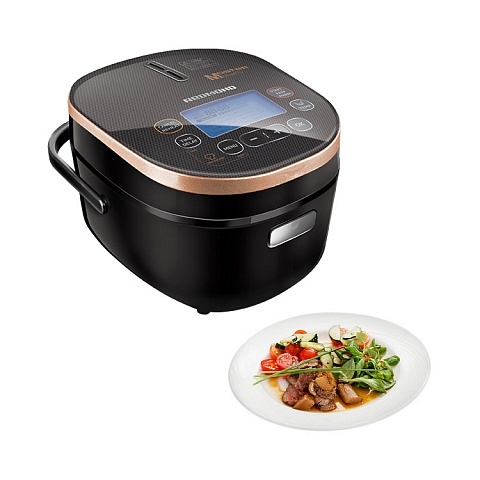 The function gives you full control over cooking process delivering perfect results every time! “MASTERCHIEF” enables to enter up to 10 time and temperature adjustments during one cooking cycle. You will find the function irreplaceable when trying new dishes. If required, you can always reset the program to its default settings. 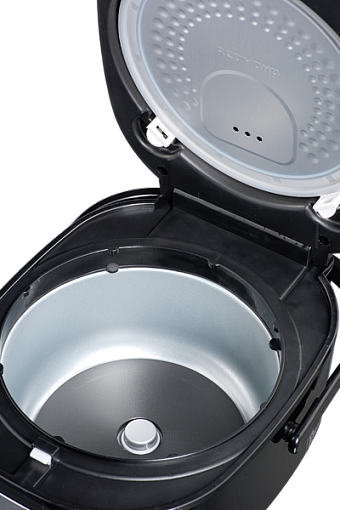 MULTICOOK is a versatile program that enables you to cook any dish with your own time and temperature settings (between 35 and 170°C). MULTICOOK allows the device to function as a number of kitchen appliances and to cook any recipe of your choice. For added convenience, the appliance automatically disables KEEP WARM function if the temperature of the program is set to 75°C or below. If required, the function can be manually enabled. “STEW” program is recommended for making meat, fish, and vegetable stews. “BAKE” is recommended for baking cakes, puddings, and pies from puff and yeast pastry dough. “BOIL/BEANS” program is for boiling meat, fish, vegetables, and different types of vegetables. “SOUP” program is used for making soups. “FRY” is recommended for frying meat, fish, vegetables, and seafood. “RICE/GRAIN” program is for cooking rice and other grains. “PASTA” is used to cook pasta, dumplings, sausages, and other convenience foods. “STEAM” is the program for steaming meat, fish, vegetables, and seafood. “PILAF” is recommended for cooking different types of rice pilafs. “BABY FOOD” program is used for making baby food. “COTTAGE CHEESE” is for making homemade cottage cheese. “YOGHURT” program is used to make different types of yoghurt. “SLOW COOK” is for cooking rich meat stews, tender ragouts and purees, and other slow cooking dishes. “GAME” is recommended for cooking wild game (large and tough cuts of meat and poultry). “PORRIDGE” is used to make different porridges with milk. “DEEP FRY” program is recommended for making French fries, nuggets, and other deep fried foods (use deep fry basket provided with the appliance). “PIZZA” is recommended for baking pizza with different toppings. “BREAD” is used for baking wheat and whole wheat-rye breads (the program includes proofing cycle). “DESSERT” program is for making different desserts. “QUICK COOK” is used for quick-cooking grains. The function allows reheating cold dishes. 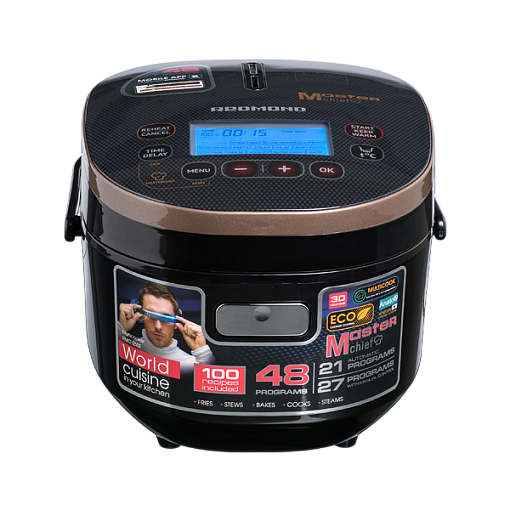 Multicooker is equipped with “Keep Warm” function which automatically activates in the end of cooking cycle and keeps the meal warm and ready to serve for hours. 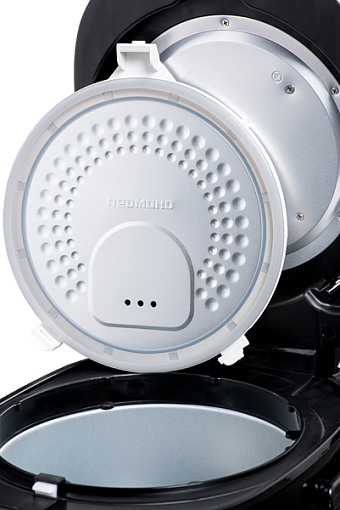 REDMOND RMC-250 allows disabling “Keep Warm” function in the beginning of cooking cycle. Automatic activation of the function in the end of cooking cycle may not be required if foods were cooked at a low temperature (yoghurt, dough, etc.). Now you won’t have to wait for the end of the cycle to disable the “Keep Warm”. The function allows programming the device to finish cooking cycle at specific time with a delay up to 24 hours. Set the timer to have nourishing breakfast or sophisticated dinner ready precisely on time. 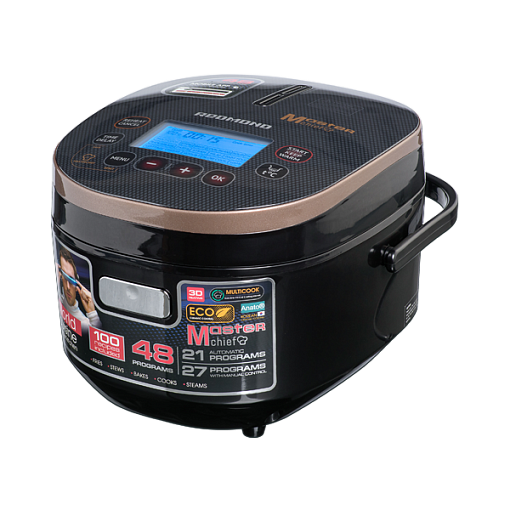 Multicooker REDMOND RMC-250 is equipped with 4-litre inner bowl, featuring high quality non-stick ceramic coating by Anato® (Korea). The coating has been rigorously tested to ensure maximum durability and highest quality. The foods fry, bake, and stew evenly without sticking, burning, or losing their flavour and nutrients. The bowl is suitable for oven use and food storage. It is easy to wash by hand or in a dishwasher. This recipe book comes as a result of a passion of REDMOND’S chefs. Each recipe has been adapted for this particular appliance. The book gives the exact amount of required ingredients and step by step procedure for each recipe. Follow our recommendations for best results!